Kagyu Samye Dzong London is under the direction of Kagyu Samye Ling Monastery and Tibetan Buddhist Centre in Scotland, the first such centre to be built in the West, which was co-f ounded by Dr Akong Tulku Rinpoche in 1967, after he had to flee Tibet for India and then the UK. 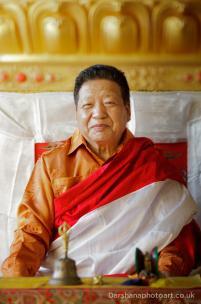 The title "Tulku" indicates someone who has been identified as a reincarnated master, and Dr Akong Tulku Rinpoche was confirmed as a holder of the Kagyu lineage by His Holiness the 16th Gyalwa Karmapa, with whom he enjoyed a close relationship, making him instrumental in the identification of his successor, the 17th Karmapa. Dr Akong Tulku Rinpoche's regular visits to Kagyu Samye Dzong London for teachings and empowerments provide therefore an exceptional opportunity to experience the Dharma from a highly accomplished practitioner, and deeply insightful mind. The present Abbot of Kagyu Samye Ling Monastery, Choje Lama Yeshe Losal Rinpoche, is also an accomplished meditation master. 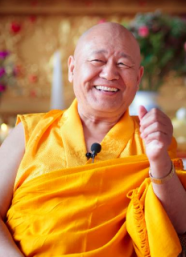 Lama Yeshe Rinpoche teaches through his example, radiating the joy, kindness and clarity that come from many years of practice. His teachings are renowned for their accessibility and good humour, and every one of his visits to Kagyu Samye Dzong London leaves participants with incomparable shared memories, and with unequalled advice to sustain their daily practice. Finally, we are privileged to have in Lama Gelongma Zangmo, the Director of the Kagyu Samye Dzong London centre and its resident teacher, someone who is a longstanding practising Buddhist of tireless dedication, selfless commitment and radiant compassion, with a great many years' experience in long-term retreats, and a firm guiding hand in service to the Dharma and to others. Lama Zangmo teaches weekly courses at Kagyu Samye Dzong London on the founding practices and texts of Tibetan Buddhism, which have an enthusiastic following.